The day did not get off to a good start for Otley who arrived at Lightfoot Green ‘sans kit’. It was suggested they play in ‘skins’ and at least one commentator warned them that the AGP was really painful without shirts! This came on top of the lack of a team sheet for the programme which didn’t arrive until after the print deadline and necessitated some clever magicianship from Joe Moxham to avoid a blank column on the centre page. The kick-off was delayed until 3.00pm to allow the Pony Express to cross the border and once Otley were ‘booted and suited’, the teams ran out on a cold but pleasant afternoon with little or no wind and although the air was damp, conditions were dry. Otley kicked off and in less than a minute were awarded a penalty, fifteen metres inside the Hoppers’ half. Scrum half, Rowntree went for the posts but the kick was wide and the hosts breathed again. Hoppers were looking lively, and from a lineout on his own 10m line a break by full back Nathan Pope saw him skipping his way through the Otley forwards to their 22 where his team were awarded a penalty. Tom Davidson, newly appointed as backs’ coach, confidently found touch on the 5m line and from the lineout Hoppers demonstrated the dominance in the drive they would have throughout the match as the pack moved forward and Ally Murray scored the first of his two tries. Davidson stroked the ball over the posts and Hoppers were off to a great start after only six minutes. Otley responded and were pressing the Preston 22m line when a knock-on gave their hosts the first scrum of the match. Hoppers were given a penalty kick, Davidson found touch on his own 10m line and from the lineout a scorching 30m run from prop Pete Altham took play down to the Otley 22. The game then settled into a pattern of end-to-end play with both sets of forwards battling for possession. A 20m break from Jordan Scott, playing at 11 on his first start after returning from injury, took his side to the Otley 5m line where, in the space of three minutes Hoppers were denied two possible tries when Gough’s effort was held up and Fitzpatrick’s attempt at the base of the post was disallowed. The team did not come away from this passage empty-handed though as they were awarded a penalty in front of the posts and Davidson put three more points on the scoreboard. With only a quarter of the match gone and the score at 10 – 0 Hoppers pressed on and from another lineout on the Otley 5m line Fitzpatrick drove over only to be held up again. The home forwards pressed on and from a re-set scrum deep in the Otley half Matt Lamprey peeled off the back and crossed the line. The conversion was good and with less than ten minutes of the half to go, Hoppers were in a commanding position at 17 – 0. This was no time for complacency however as Otley struck back with a penalty in front of the posts. Unfazed, Hoppers fought their way back up the field and responded with their own three-pointer thus cancelling their visitors’ advance. The crowd had been well entertained but, just as the home supporters were about to head off for their half time pies, Otley’s Rowntree made a break, passed the ball to De Glanville to score with two minutes to the half time whistle. Although Rowntree’s conversion was good he missed a further penalty in the forty-third minute and the teams went in with the score at 20 – 10. The half had shown a welcome return of confidence from the home players. Possession, which of late has been poor, was much better, and the handling and passing more accurate. The forwards were dominating the scrum and the backs showed some flowing moves and good clearance kicking. Hoppers kicked off the second half and almost immediately, Otley were awarded a penalty just inside their opponents’ half. The ambitious kick was short and wide and the game settled back into the ebb and flow the crowd had experienced in the first half of the match. There was much to enjoy from both sides with the likes of Alex Hurst showing footwork that would win him Hoppers’ ‘Strictly’ as he danced his way through the opposition and having had a quiet (for him) first period, Tyler Spence made his own telling break into the Otley half. 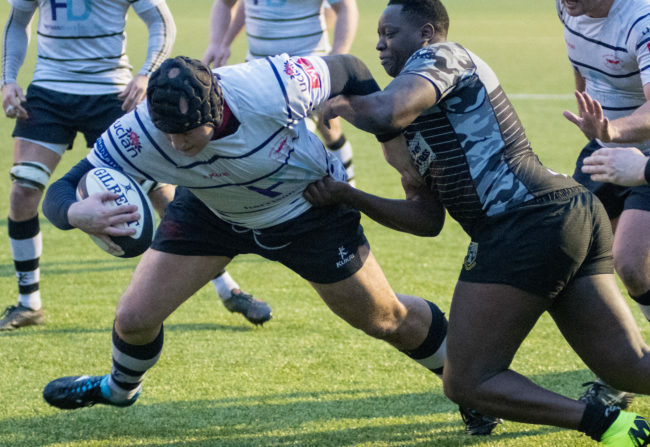 The turning point of the match was a heart-stopping fumble of the ball on the Preston line which gave the visitors a scrum and the chance to put real pressure on the home side. Play was then fast and furious and at one point the ball was bouncing around behind the Hoppers’ try line. Order was restored with a clearance kick by Pope and the crowd could breathe again. Hoppers had some good possession in the last quarter with a stream of lineouts, too many of which were lost throwing long to the tail. The forwards continued to pressurize the Otley line with a series of phases taking play from side to side across the front of the posts. A slick offload from Luke Proctor had Lamprey leading a surge to the line only for the referee and touch judge to agree they could not determine a touchdown. The effort was not lost though as, from the scrum, Ally Murray drove over to score his second try and whilst the conversion failed Hoppers looked to be in the driving seat with just seven minutes to go. Perhaps seeking to ensure there was to be no repeat of the early season losses in the dying minutes, Hoppers continued to attack with the backs putting in some smooth passing moves and breaks by Ryan Carlson and Tyler Spence pushing play deep into the Otley half. The match ended with Hoppers dominating play in the Otley half and with the visitors losing the ball forward, the whistle marked a welcome win for the home side. It was a happy Paul Arnold who commented on the game. ‘It was good to get the win. There were some nerves coming into this game on the back of three losses. Otley are a strong side and the match at Cross Green had been close. With three tries scored and a possible further three denied, a show of dominance by the forwards and some confident play from the backs, Hoppers have demonstrated their ability to best good sides in this league. Next week is another tester with Wharfedale making the trip over the border and our lads will be looking to redress the defeat of the first encounter.